Nonetheless, however you may wish to spin either adage, the fact of the matter is that Oregon State starting pitching is beating good hitting across all of college baseball. The Oregon State Beavers starting rotation is anchored by three particular solid starters, all worthy of “staff ace” recognition. The mainstay of the rotation is Matt Boyd, a senior and sixth-round draft pick by the Toronto Blue Jays in last week’s MLB draft, who has led the charge along with junior southpaw Ben Wetzler (a fifth-round draft pick by the Philadelphia Phillies) and freshman All-American Andrew Moore. This pitching trio has led the Beavers to a 50-11 record this season and recognition as the number three ranked team in the nation coming into NCAA Tournament play. Boyd, Wetzler, and Moore have started 48 of the Oregon States’ 61 games this season, leading the Beavers to a 33-5 record in those contests. Much of that success has occurred throughout regional and super regional play, as the trio led a sweep of the competition in the Corvallis Regional and once again led the charge against the Kansas State Wildcats in the Corvallis Super Regional, helping the Beavers reach their first College World Series since winning back-to-back NCAA titles in 2006 and 2007. Boyd led off regionals with a solid performance against UTSA, surrendering three runs in 6 2/3 innings of work, an outing that cemented a 5-4 victory for the Beavers. 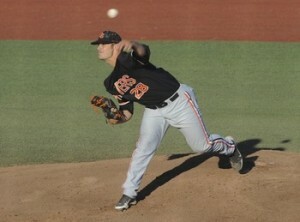 Having served as Oregon State’s go-to closer for much of his first three seasons, Boyd was placed into the starting rotation this spring and has impressed as the Beavers’ staff ace. In 17 starts this season, Boyd boasts a 10-3 record and 2.13 ERA with a strong 110/30 strikeout to walk ratio in 122.2 innings. Boyd possesses a solid four-pitch arsenal that he commands and mixes with solid efficiency, as well as an intriguing three-quarter arm slot that he uses to deceive batters with an effective fastball and slider combination. Boyd has brought in his mid-90s heat, imposing delivery, and tenacity into the rotation this spring and has flourished for the Beavers. Pac-10 Conference Player of the Year Andrew Moore would turn in a phenomenal outing in game two, going eight strong innings and surrendering just one run in a 3-2 victory over UC Santa Barbara. Moore has been more than impressive in his freshman season at Oregon State, placing his name amongst the best pitchers in college baseball and cementing his rank as a potential top draft pick in the future. In 17 starts this season, Moore has posted a 14-1 record and 1.36 ERA along with a 70/26 strikeout to walk ratio in 119.0 innings of work, not to mention three complete-game shutouts. 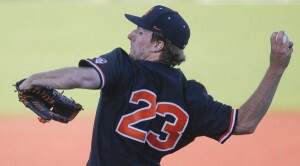 Wetzler would get the nod in the Corvallis Regional Championship game, going the distance and striking out 10 batters in a 6-1 rout of Texas A&M, leading the Beavers into the super regionals where they would host the hard-charging Kansas State Wildcats. Wetzler was selected by the Phillies in the fifth-round of this year’s MLB First-Year Player Draft, after a solid season in which he has posted a 9-1 record and 2.11 ERA in 89.2 innings of work. Boyd pitched a strong outing in game one of the Corvallis Super Regional, going seven innings of one run ball; however, a late charge by the Wildcats would result in a 6-2 loss for the Beavers. However, the Beavers would take control of the series in games two and three behind the workhorse-efforts of Moore and Wetzler. In game two, Moore kept the Kansas State offense in line, surrendering three runs in eight innings of work, fanning nine batters. A strong offensive showing would cement a 12-4 rout of Kansas State in game two, setting up a win or go-home game three. Despite a late charge by the Wildcats, the Beavers held on to win game three 4-3 and advance to their fifth College World Series appearance in school history. Wetzler closed out the super regionals with a solid performance, pitching 7 2/3 innings and holding the Wildcats to three runs. Oregon State head coach Pat Casey represents many in his comments regarding the stability that the trio has brought to a determined Beavers team. 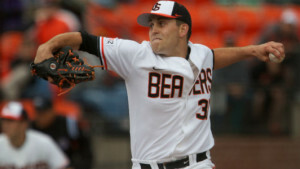 As for Matt Boyd, he very well understands the strength of the Beavers’ rotation and is confident in not only his stuff, but also the talents of his teammates. “We’ve got the best pitching staff in the nation and the best bullpen in the nation. There’s no doubt about that,” said Boyd. While the Beavers rotation has garnered national attention, one particular individual on the field for Oregon State has not. That individual is starting catcher Jake Rodriguez, who Boyd, Wetzler, and Moore cite as the primary source of their success this season. Rodriguez has been able to balance the different approaches and dispositions of each of the three starters, allowing each to reach their maximum potential with relative ease.